Are you looking for a quick, delicious, no bake dessert? 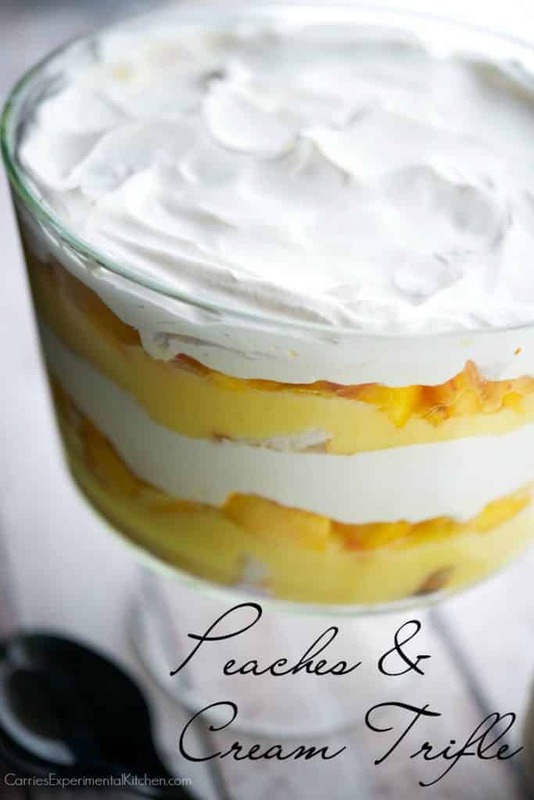 Then this Peaches & Cream Trifle will be a definite hit. I recently made this Peaches & Cream Trifle when my niece and her boyfriend came up for dinner. It was a few days before her birthday so I wanted to make something really quick and easy for dessert so that I didn’t have to spend my entire time in the kitchen and had more time to socialize since we don’t get to see them as often as we used to. It happens to all families; it’s all par for the course of growing up. They get boyfriends, girlfriends, spouses and even children of their own. When they were little my husband and I were the “cool” aunt and uncle who took all of the kids from both sides of the family (6 of them at the time) and had sleepovers so their parents could get a night out. We would make kid-friendly dinners, play games, or watch movies; just spend the night laughing, bonding and having a great time. As time went on the sleepovers became less frequent, but we still got to see them for birthday parties, holidays and the occasional family outings like apple or pumpkin picking or their school performances. When the girls were old enough to drive, they became babysitters for our own girls; who idolized their older cousins. But time goes on and then our own children were old enough to not need babysitters any longer, the cousins were in college and busy working and now we only see them a few times a year if we’re lucky. That brings me back to this Peaches & Cream Trifle. Since my niece was coming over for dinner with her longtime boyfriend, I asked her what she wanted and of course, she wanted Chicken Francaise (her favorite recipe in my cookbook), but she didn’t care about dessert. I had just picked up some fresh peaches and was going to make a Peach Crisp, but wanted to try something new and came up with this trifle. I went super-simple with this recipe and used store bought angel food cake, vanilla pudding, fresh peaches and light whipped topping. That’s it. Four simple ingredients and this trifle was a huge hit! Prepare the vanilla pudding according to package directions and allow to cool. I used instant so it was ready quicker, but if you use regular pudding mix, prepare it the day before so it sets. 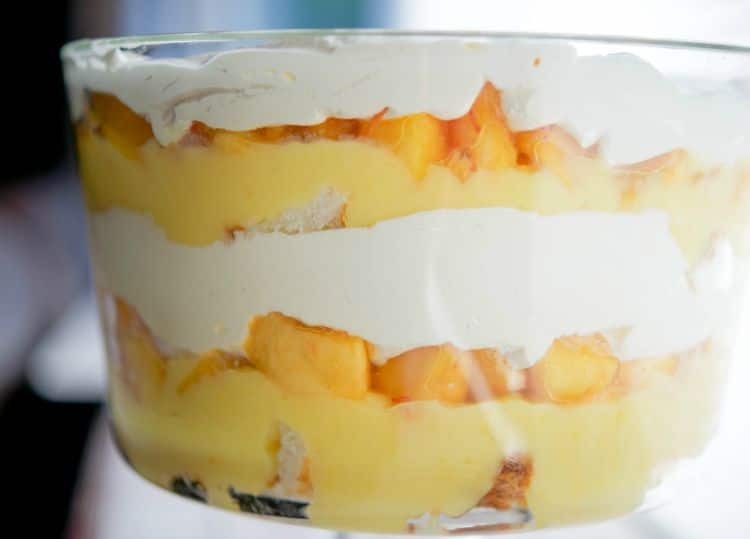 Place half of the angel food cake; which is cut into cubes, into the bottom of a trifle dish; then spread half of the prepared pudding, half of the diced peaches and layer with half of the whipped topping. Repeat a second layer of each for the remaining ingredients and place in the refrigerator until ready to serve. This Peaches & Cream Trifle was delicious, so light and everyone loved it. I hope you enjoy it as well.~Enjoy! Are you looking for a quick, delicious, no bake dessert? 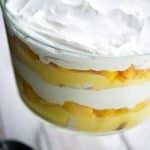 Then this four ingredient Peaches & Cream Trifle will be a definite hit. Prepare the vanilla pudding according to package directions and allow to cool. Place half of the angel food cake cubes into the bottom of a trifle dish; then spread with half of the prepared pudding, 4 cups of the diced peaches and layer with half of the whipped topping. Repeat a second layer of each for the remaining ingredients. Try these peach recipes too! Talk about delicious, I mean Yummy! I made it with lemon pudding because I had it. Great success.There was a little left the next day as I hoped there would be and still delicious but it did not hold it’s shape as well. Definately 5 stars!!! Oh lemon pudding sounds like it would be so good!I’m so glad you enjoyed it Anna, thank you for trying the recipe. how delicious! so easy to make! Yum!! Thank you so much for this quick and easy recipe. I had asian cheesecake on hand (more like a denser sponge cake from 99 Ranch Market), and my local Trader Joe’s didn’t have fresh peaches or vanilla pudding mix so I used their canned (glass jar) peaches and rice pudding. Also made fresh whipped cream. People loved it! Will for sure try with the original recipe when I’m more prepared next time.